Even though you can often find people giving or throwing away classic Macintosh computers because of their age, some of them may still be in need of repair. If you have a machine that you want to try to bring back to peak condition, sometimes repairs are actually feasible, assuming you have the right tools. 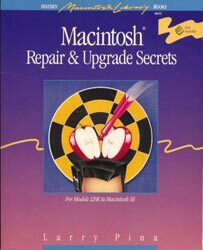 The best book for attempting repairs on your classic Apple Macintosh computer is probably "Macintosh Repair and Upgrade Secrets" by Larry Pina (ISBN # 0672484528). This book has been out of print forever, but you can still find used copies on eBay or other places from time to time. I actually owned a copy of this book years ago (back when it was actually extremely useful, and would have saved a lot of money), but somehow lost it during my travels. I recently managed to pick up a copy again. The best part of this book is that it originally included a floppy diskette inside the back cover containing diagnostics you could run on your Macintosh computer. These would help you align the screen image and guide you through fixing problems related to the display. However, it seems as though the majority of these disks have gotten lost or destroyed through the years. When I was looking for my copy of this book, the vast majority of the books being advertised for sale online specifically indicate that the diskette is missing or gone. I guess this means it was useful to someone else back in 1989, but it is a shame since anyone nowadays attempting their own repairs bringing one of these antiques back to life could really use this diskette. This book has been out of print for almost twenty years, and I doubt they will be reprinting any more copies in the near future. As a community service, I am going to mirror a copy of the diskette online here. Legally, you are likely only entitled to download this diskette if you purchased a copy of the book without the diskette included, or were unable to track one down through any other means. Due to the age of the book and diskette, your copy may also be degrading over time, so this may help you if you have discovered that your disk is bad. You can download a copy of the diagnostic utilities disk if you click here.